I need a new design here. I started making one, then decided it was ugly and that I could do better. One of these weekends I need to seclude myself in a coffee shop and just figure it out. I also kind of want a better blog purpose. I have been inspired while reading Smitten Kitchen and Julie & Julia and I Love Typography and CSS Tricks and my brother’s experiences about living in Taiwan. Perhaps I just need to be better about writing more often. I need to be less shy about sharing my life and the things I enjoy doing. 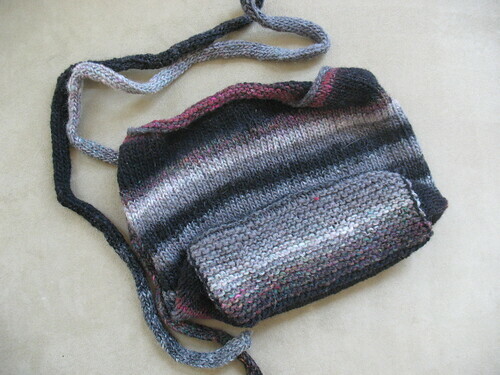 This past weekend I finally felted a Booga Bag I knit about 4 years ago. It’s been in the closet for quite some time, just waiting for its turn. I’m finally determined to finish up current projects so I can move on to new ones. I brought it over to Karyn’s house since she has felted many things. Under her supervision, I pulled it out of the washer a few times to check the felting process. Before it was finished, I noticed some very disappointing holes (two in the bottom, one in the side). 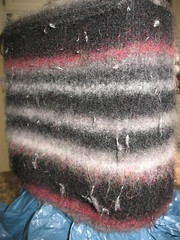 I’m not sure if it was bad knitting (it was one of my first projects) or if moths got to it—I didn’t notice prior to felting. In any case, it’s dry now. I think I want to get some cute fabric to insert a liner so I don’t have to worry so much about the holes.